We believe it’s how you live that matters and are proud to build places you call home in unbeatable locations with amenities that meet your lifestyle. Harpers Mill in Chesterfield, VA is a prime example! HHHunt Homes offers stunning single-family homes in this destination community. HHHunt is proudly building beautiful homes in three thriving neighborhoods within Harpers Mill. The Glen Royal, Hartridge, and Timberstone neighborhoods boast seven stylish floorplans. Starting from the mid $300s, each thoughtfully-designed floorplan features 3-4 bedrooms, 2-3 bathrooms, a two-car garage, and 2,000 to more than 3,400 square feet of bright space. The homes at Harpers Mill also include private, wooded homesites as well as third floor and walk-out basement options. We just released brand new homesites in the Timberstone neighborhood that are sure to go fast! 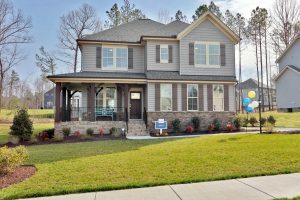 Harpers Mill is a thriving master-planned community where homeowners can enjoy more than just their dream home. Combining convenience and serenity in the Cosby High School district, Harpers Mill includes over 240 acres of reserved open space, miles of walking trails, a retail center, and award-winning amenities such as a resort-style pool, dog park, clubhouse, sports field, and more. The community is perfect for enjoying evenings outside, socializing with neighbors through community-organized events, and creating lasting memories. The best shopping, dining, and entertainment destinations in Chesterfield County are also just minutes from Harpers Mill! Harpers Mill offers homebuyers of all levels everything they need to enjoy the best things in life. We invite you to discover your dream home at Harpers Mill by visiting this incredible community or our website to learn more today!